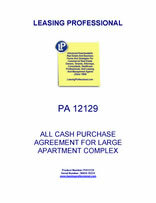 This form is a real estate purchase contract for a large apartment complex with the buyer paying all cash at closing. All property constituting the apartment complex is included in the sale, including the land, the buildings, and the personal property and intangibles related to the apartments. Such personal property expressly includes the marketing materials for the apartment property, the construction drawings, all warranties relating to the apartment complex, governmental approvals and permits, and trade names used and belonging to the property. All leases for the complex and the security deposits made pursuant to such leases are assigned to the buyer at the closing. The buyer has forty five days to conduct its due diligence evaluation of the apartment complex, and has access to the property during that period to perform inspections and tests. The agreement also constitutes joint escrow instructions to the title company and the escrow agent handling the closing. Other Features Customary Elements of a Real Estate Purchase Agreement Are Included, Including Proration of Taxes, Utilities, and Assignment of Leases and Property ContractsTo Purchaser, Etc. A. Seller owns that certain real property consisting of approximately of _______ acres of Property, more or less, and commonly known as the ___________ Apartments, located at _______________________ County of _______, State of _______, and more particularly described on Exhibit “A” attached hereto. B. The Property consists of an apartment complex consisting of _____________ (___) units, together with all appurtenances, improvements, buildings, fixtures, and personal property. C.	Buyer wishes to purchase the Property for the price and on the terms set forth herein. 1. ASSETS INCLUDED IN SALE. (a) Real Property. The fee simple interest in that certain parcel of real property commonly known as the _______ Apartments, located at _________________________, and situated on approximately ____ acres as more particularly described in Exhibit “A” attached hereto. (c) Improvements. Any and all buildings and improvements together with fixtures and articles of property attached or appurtenant to the Property, including, but not limited to, all apparatus, equipment, appliances and facilities used to provide any utility services, ventilation, or other services thereto, together with all plumbing, lighting, electrical, and related fixtures, to the extent that they are located in or on the premises herein described (all of which hereinafter, collectively, “Improvements”). (d) Personal Property. Any and all personal property owned by Seller located on or in or used in connection with the operation of the Property as listed in Exhibit “B” attached hereto. The personal property will be transferred by Bill of Sale at the closing using the Bill of Sale form attached hereto as Exhibit “C” (hereinafter the “Personal Property”). (e) Intangibles. Seller shall assign to Buyer any and all interest of Seller in any and all leases and/or rights of first refusal as the same may be connected with the Property, together with any and all development applications, permits, maps, surveys, studies, or other rights that may currently exist or which may arise between the date this contract is executed and the closing date (hereinafter, collectively, the “Intangibles”). Seller shall convey all Intangibles that it has in and to all development rights and other intangibles, including, but not limited to, certificates of occupancy, licenses, authorizations, approvals, permits, and signage rights relating to or affecting the Property to the extent the same may be owned or controlled by Seller and are assignable to Buyer which intangibles are listed in Exhibit “D”. (f) Tenant Leases and Security Deposits. Seller shall assign and Buyer shall assume all tenant leases affecting the Real Property (hereinafter, collectively, the “ Tenant Leases ”) in effect at the Closing Date and Seller shall assign to Buyer all security deposits, pet deposits and other deposits or sums held by or for Seller for the account of tenants under the Tenant Leases (hereinafter, collectively, the “Security Deposits”), all pursuant to the Assignment and Assumption of Lease Agreements in the form set forth on Exhibit “E” attached hereto. All of the items described in subsections (a), (b), (c), (d), (e) and (f) above are intended to be consistent with each other and in furtherance of the parties’ objective that Buyer is purchasing all of Seller’s interests in the Property itself so as to own and control such interests to the same extent that Seller owns and controls them except as to those rights that are non-assignable, related to adjacent properties, or specifically excepted by other provisions of this Agreement. The Purchase Price of the Property is _________________ Dollars ($_________) (hereinafter “Purchase Price”). The Purchase Price shall be paid all in cash or other immediately available funds at the “Closing” (as hereinafter defined). (a) On or before two (2) business days after the Effective Date, Buyer shall cause immediately available funds to be deposited into “Escrow” (as hereinafter defined) with the Title Company in the amount of One Hundred Thousand Dollars ($100,000) which sum shall represent Buyer’s “Initial Deposit” into escrow. In the event Escrow terminates as set forth in Section 5 or 6 below or in the event Buyer terminates this Agreement pursuant to any other right of termination afforded to Buyer under the terms of this Agreement, then the Initial Deposit, together with interest thereon, shall be returned to Buyer. (b) After the expiration of the time periods during which Buyer may terminate this Agreement as set forth in Sections 5 and 6 below, and if Buyer has not sooner terminated this Agreement, then Buyer shall on or before two (2) business days thereafter increase the Initial Deposit by delivering to the Title Company an additional One Hundred Thousand Dollars ($100,000), which sum shall represent Buyer’s “Additional Deposit” into Escrow. The aggregate of the Initial Deposit and the Additional Deposit shall total Two Hundred Thousand Dollars ($200,000) (hereinafter the “Increased Deposit”). The Increased Deposit shall be refundable to Buyer only if Buyer terminates this Agreement pursuant to a right of termination afforded to Buyer under the terms of this Agreement. If Buyer fails to deposit the Additional Deposit within the time period specified above, then if this Agreement has not been sooner terminated, Seller may terminate this Agreement at its option and demand the release of the Initial Deposit to Seller; in this event, the Initial Deposit shall be released to Seller by Escrow Agent without further written instructions from Buyer. For purposes of this Agreement, the term “Deposit” shall mean and refer to the Initial Deposit, the Additional Deposit, and all other sums, if any, which are deposited by Buyer under the terms and provisions of this Agreement, together with all of the interest which accrues on such sums. (c) After the expiration of the contingency periods set forth in Sections 5 and 6 below, either the Initial Deposit or the Increased Deposit, as the case may be, shall become non-refundable (except as otherwise provided in this Agreement) and shall be applied to the Purchase Price at Closing. However, if Escrow and this transaction fail to close solely as the result of Buyer’s breach of this Agreement after the expiration of the contingency periods set forth in Sections 5 and 6, below, and after the expiration of any applicable notice and cure periods, then provided Seller is ready, willing and able to perform its obligations hereunder, Seller shall be relieved of its obligation to convey title to the Property and, as Seller’s sole and exclusive remedy, shall be entitled to the Increased Deposit (exclusive of interest and dividends earned thereon) as liquidated damages. In this event, the Increased Deposit shall be released to Seller by Escrow Agent upon Seller’s demand without further written instructions from Buyer. THE PARTIES HAVE AGREED THAT SELLER’S ACTUAL DAMAGES, IN THE EVENT OF A DEFAULT BY BUYER, WOULD BE EXTREMELY DIFFICULT OR IMPRACTICABLE TO DETERMINE. THEREFORE, BY PLACING THEIR INITIALS BELOW, THE PARTIES ACKNOWLEDGE THAT THE INCREASED DEPOSIT AMOUNT HAS BEEN AGREED UPON, AFTER NEGOTIATION, AS THE PARTIES’ REASONABLE ESTIMATE OF SELLER’S DAMAGES AND AS SELLER’S EXCLUSIVE REMEDY AGAINST BUYER, AT LAW OR IN EQUITY, IN THE EVENT OF A DEFAULT UNDER THIS AGREEMENT SOLELY ON THE PART OF BUYER. THE PAYMENT OF SUCH AMOUNT AS LIQUIDATED DAMAGES IS NOT INTENDED AS A FORFEITURE OR PENALTY, BUT IS INTENDED TO CONSTITUTE LIQUIDATED DAMAGES TO SELLER. (d) Buyer has paid to Seller, or will pay to Seller, independent contract consideration in the amount of ______________ and No/100 Dollars ($_______) (the “Independent Contract Consideration”). The Independent Contract Consideration: (a) is delivered by Buyer to Seller as consideration for Buyer’s exclusive right and option to purchase the Property pursuant to this Agreement; (b) is in addition to and independent of any other consideration or payment provided in this Agreement; (c) is nonrefundable to Buyer and shall be retained by Seller notwithstanding any other provision of this Agreement to the contrary; and (d) shall be credited against and applied in reduction of the Purchase Price at the Closing (hereinafter defined). If this Agreement is terminated for any reason and the Independent Contract Consideration has not been previously paid to Seller, then notwithstanding any provision in this Agreement to the contrary, an amount of money equal to the Independent Contract Consideration will be disbursed to Seller out of the Deposit. 4. TRANSFER OF THE PROPERTY. (a) Real Property. At the Closing, Seller shall convey to Buyer (or assignee) fee simple title to the Real Property, Appurtenances and Improvements by duly executed and acknowledged Special Warranty Deed in the form attached hereto as Exhibit “G” (hereinafter “Deed”). Conclusive evidence of delivery of fee simple title shall be the issuance by the Title Company of an Owner’s Policy of Title Insurance in the full amount of the Purchase Price insuring fee simple title to the Real Property in Buyer, subject only to those exceptions as Buyer approves pursuant to Section 5 below (hereinafter “Permitted Exceptions”) or as the same may be reflected on the Special Warranty Deed. Said policy shall contain such special endorsements as Buyer may reasonably require at Buyer’s sole cost and expense. The Title Company shall obtain, if requested by Buyer, such endorsements and/or reinsurance agreements from such companies and in such amounts as Buyer may request. (b) Personal Property. At the Closing, Seller shall transfer title to the personal property by means of a Bill of Sale in the form attached hereto as Exhibit “C,” such title to be free of any liens and encumbrances. (c) Permits, Licenses and Intangibles. At the Closing, Seller shall transfer all Intangibles together with other development rights by means of a General Assignment in the form attached hereto as Exhibit ”D”. (d) Tenant Leases and Security Deposits. At the Closing, Seller shall transfer to Buyer and Buyer shall assume all liability under the Tenant Leases and Seller shall assign and transfer to Buyer all of the Security Deposits. Such assignments and assumption shall be accomplished by means of the Assignment and Assumption of Lease Agreements in the form attached hereto as Exhibit “E”. 5. TITLE INSPECTION AND CONTINGENCY REMOVAL. (iv) (iv) copies of the most recent property tax bills for the property; and (v) the vesting deed for the Real Property and the Appurtenances. Any exception to title is deemed accepted by Buyer and a Permitted Exception hereunder unless Buyer notifies Seller otherwise in writing on or before the expiration of the Title Contingency Period (as defined below). Notwithstanding the foregoing, if any updates to the Title Commitment or the Existing Survey are received by Buyer, Buyer shall have an additional five (5) business days, regardless of the expiration of the Title Contingency Period or the proposed Closing Date, following Buyer’s receipt of such update and legible copies of all documents referenced therein to notify Seller of objections to items shown on any such update. As a condition to Closing, Seller shall take all action necessary to remove from title to the Property at or prior to the Closing (or in the alternative, Seller shall obtain for Buyer title insurance insuring over such exceptions or matters, such insurance to be in form and substance satisfactory to Buyer in its sole discretion) the following matters: (A) all exceptions to title and survey matters created on or after the Effective Date without the prior written consent of Buyer (which consent may be withheld in Buyer’s sole and absolute discretion) other than monetary exceptions which Seller removes at the Closing; (B) any and all liens and encumbrances affecting the Property which secure an obligation to pay money (other than installments of real estate taxes or assessments not delinquent as of the Closing); and (C) subject to proration, all taxes and assessments due and payable for any period prior to the Closing (hereinafter, collectively, “Obligatory Removal Exceptions”). (b) Buyer’s Contingency Removal Period. Buyer shall have twenty (20) days from the receipt of all of the documents and information set forth in Subsection 5(a) above (hereinafter “Title Documents”) to determine if, other than the Obligatory Removal Exceptions which will be paid off at the close of Escrow, there are any exceptions to title to which Buyer objects. Unless written rejection of said title matters is received within said twenty (20) day period following delivery of all Title Documents (the “Title Contingency Period”), Buyer shall be deemed to have accepted all title matters and such title matters shall be deemed to be Permitted Exceptions. From the date of Buyer’s approval of title, Seller shall not permit any adverse change to arise to the title (other than monetary encumbrances removable at the Closing) nor shall Seller permit any cloud upon title not disclosed in the Title Documents to arise so as to affect title at Closing, unless the same can be removed by monetary remedies at Closing. If Buyer objects to any title matter, then Seller shall have five (5) business days from receipt of Seller’s written notice (the “Reply Period”) to advise Buyer in writing that: (i) Seller can remove the title matter prior to, or at, the Closing; or (ii) that the title matter is not curable by Seller prior to or at the Closing. If Seller is able to remove the title objection as set forth in (i) above, the transaction shall proceed. If Seller advises Buyer that Seller cannot (or will not) remove the title objection or fails to reply at all, then Buyer shall have five (5) business days from and after Buyer’s receipt of Seller’s written reply or the expiration of the Reply Period, whichever occurs first, to determine if Buyer will accept title as Seller has indicated pursuant to this subsection. If Buyer elects, in writing, not to accept title, then, this Agreement shall terminate, the Deposit shall be returned to Buyer immediately, and thereafter neither party shall thereafter have any rights or obligations to the other hereunder, other than pursuant to any provision hereof which expressly survives the termination of this Agreement.